What happens to oil rigs when they outlive their usefulness? 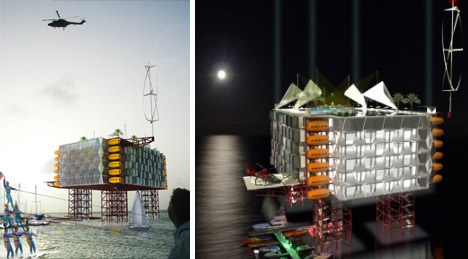 If Morris Architects have their way, the rigs will become luxury offshore hotels featuring shipping container rooms. The cargo containers will be an obvious and humorous reference to the shared marine-based past lives of both the containers and the oil rigs. It may sound far-fetched, but it’s far less harmful and wasteful than blowing up the unused rigs like we do today.